By the time Central Tech students graduate, they know enough plumbing to go straight to work in the field. 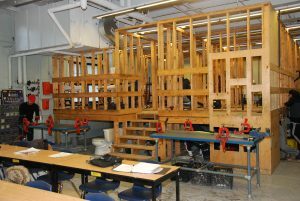 It has been a decade since one of our writers has visited a plumbing program at Central Technology High School in downtown Toronto. There have been many changes. Currently, the school has two dedicated shops for residential and commercial plumbing. Both shops have undergone numerous improvements to make sure students will learn on equipment similar to what they would encounter in the field. The quality of the equipment has improved substantially too. Back in 2008, teacher Robert Schrader would find old toilets and other products on the side of the street for his students to work on. Today, he still does roam the streets to find discarded plumbing products, but this isn’t the only way his students get parts to work with. Today, a number of manufacturers and distributors donate toilets, water heaters, tools, pipe, etc. to the program so that the students can have proper equipment to practice and learn on. Moen, American Standard, Dahl Bros. and NEXT Supply were a few of the companies that were mentioned to donate products. “My budget isn’t growing. It’s getting less and less and less, so the donations really help,” said Schrader. Central Tech offers two plumbing programs: the Ontario Youth Apprenticeship Program (OYAP) and the Special High School Major (SHSM). Students learn to plumb an entire bathroom in the residential shop. Students take the SHSM program in Grades 11 and 12 with Schrader’s co-instructor/teacher Peter Mandros. They take the plumbing program for two semesters and work on their high school credits – math and English – during the others. The OYAP program is a one-year program available to anyone under the age of 21 at no cost. It is similar to a pre-apprenticeship program. Before graduation, all students will receive WHIMIS (safety), fall protection, and first-aid training. A big part of the program is the co-op placements with area contractors. Students are in high demand. Schrader proudly showed an entire drawer which was dedicated to companies that have reached out to him to get their students during their co-op. “They are all like second-year apprentices when they go out on their co-ops,” he said. The program has seen a bit of a dip in the number of applicants since 2008. Back then, there were upwards of 40 applicants which had to apply and then interview for a spot into the program. Now, there are just enough applicants to fill the program. Last year, Schrader received 19 applicants, most of which learned about the program through word-of-mouth from family members or friends that had been in the program themselves. “The interest into all the programs in the trades are not what they used to be,” he said, noting that school enrolment numbers across the board have been decreasing over the past few years, which may also have an impact on the number of applicants. Instructor Robert Schrader helps student Joshua Yumbla on an assignment. Today, many of the companies that take Central Tech students in co-op placements or hire graduates are owned by previous participants in the program. “They want to give back to the program and students,” said Schrader. 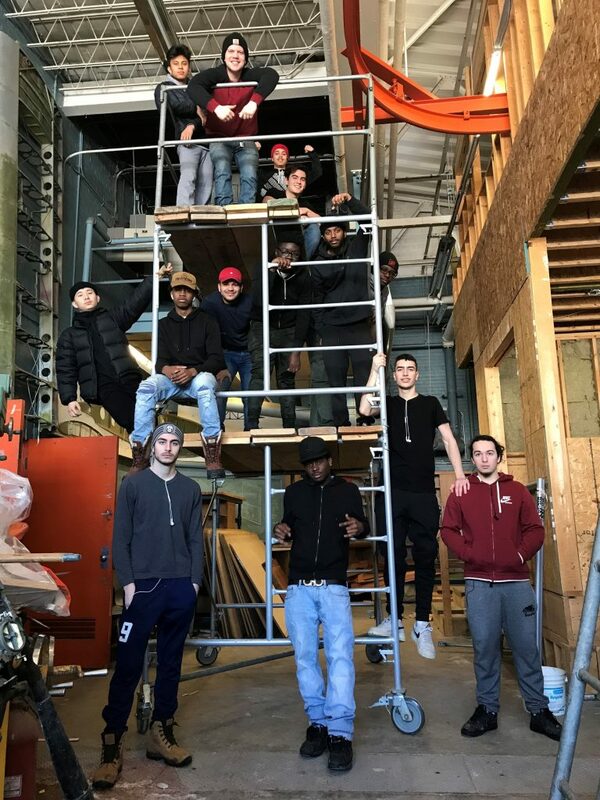 A group picture on the wall tells the story – a company photo of an alumnus with apprentices and co-op students that now work for his company at various levels. While in the OYAP and SHSM program, students will gain experience in copper pipe installations including kitchen and four-piece bath, sizing of potable water and drain installations, and steel pipe measuring, cutting and threading. These topics have been taught in the program for years. Today, there is also a focus on newer plumbing projects including green plumbing projects, dual flush toilets, greywater systems, and geothermal systems. Students must also demonstrate the ability to accurately quote jobs and create invoices. At the end, they will hand in a bill and compare it to the initial quote. This exercise teaches the students valuable “accountability” qualities which will help them in the real world, said Schrader. 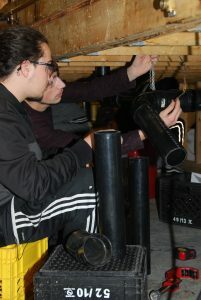 Students Matteo Florindi and Gianmarco Delmedico install piping as part of a residential shop assignment. As a way to show the students what mistakes could cost them, Schrader will pull up a menu from The Keg restaurant to illustrate what a nice meal they could have had if they didn’t forget to add a faucet on the invoice, for example. These skills that they learn from class get to be applied to real-life scenarios each year at the Ontario Skills Competition. At last year’s competition, one student earned a gold and another a silver. Central Tech has been competing in the competition for 13 years, and during that time have taken home 11 gold and two silvers. “I think a lot of people underestimate the skill sets that high school students have,” said Schrader.